Editor's Comments: This article appeared in "Nostalgia" in the October, 1985 Gazette. 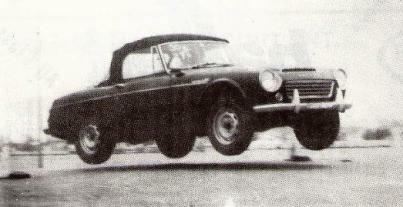 The "Mystery Driver" is Hank Kliner, driving "Baby," Hank's Datsun 1600. Photo taken at Aero Commander Plant in Bethany. 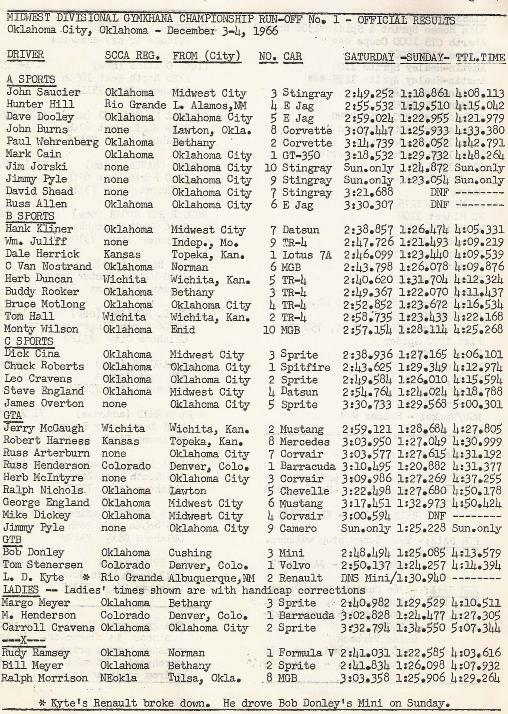 Below Hank's photo are the Gazette article and complete results from the December, 1966 Gazette. 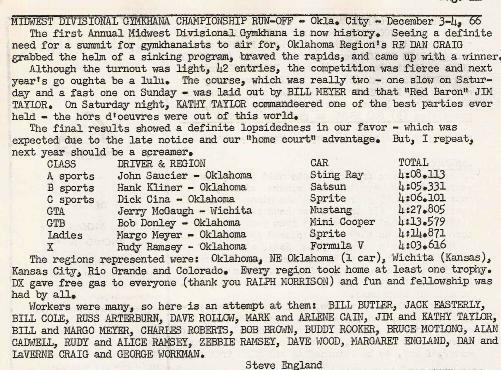 Do you know that the Oklahoma Region held the very first Midwest Division Championship Solo II event? We launched the initial event in December of 1966 at Shepherd Mall, starting what has become a national championship series complete with sponsorship and participation of hundreds of entrants from all over the U. S.
The term Solo II actually had not been invented in 1966; it was called a Gymkhana then, a name which came to us from the English who gave us a majority of our sports cars in the first decade or two of SCCA history. Other names were sometimes used to describe this type of competition, driving against the clock; autocross and field trial were two other English derived names used and from the west coast came the term slalom, a name with snow ski ancestry which is still used in some areas. Our SCCA leaders in Denver, recognizing the potential membership interest in this type of event, decided to give it a name identified solely with SCCA. We had a Solo I program already in existence for racers so the Solo II was a logical, convenient and meaningful addition. This occurred in 1970 and with it came a set of standard rules making it possible for all regions to compete for a ‘fair-to-all’ national championship. Now to a photo quiz! Below you see a snapshot taken over fifteen years ago of a driver who was obviously having a good time at one of our Gymkhanas. He won his class that day and incidentally, was also a winner in the first MIDDIV event I mentioned above. He is still a member of Oklahoma Region. Can you give me his name? Do you remember the location of the event where the airborne tactic was used?